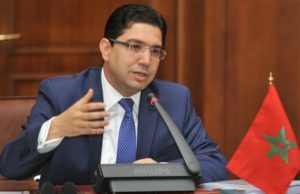 Moroccan Foreign Minister Nasser Bourita said relations between Morocco and Algeria are at a standstill and have not witnessed any evolution for years. Relations between the two countries deteriorated because of the dispute over the Moroccan Sahara and Algerian leaders’ persistence to defend the lost causes of the Polisario, a separatist Front they created at the time of the Cold War, with the sole aim of weakening their Moroccan neighbor and imposing their leadership in the region. In an interview published Monday by Jeune Afrique magazine, the head of Moroccan diplomacy lamented the lack of cooperation at all levels between the two countries. Nasser Bourita said in this connection that no bilateral visits were exchanged for more than seven years. Coordination remains static at all levels. The Arab Maghreb Union has not convened meetings in years and remains the least integrated grouping in the continent. The Moroccan official blamed Algerian leaders for the diplomatic and media campaigns they have been staging against Morocco since the announcement of the Kingdom’s return within the African Union in January 2017. He said he was ready to work with all non-hostile countries, even if their standpoints on the Moroccan Sahara date back to a bygone era. Nasser Bourita also brought up Morocco’s membership to the Economic Community of West African States (ECOWAS), stating that the regional grouping approved in principle this membership, which is now under legal review and that technical negotiations will follow. “We are in contact with the ECOWAS Commission as we prepare for the Lomé summit (scheduled for December)”, he said, explaining that the geographical argument put forward by those opposed to Morocco’s membership was unfounded. He insisted further that Morocco will be a valuable asset to the ECOWAS, recalling that the response of the ECOWAS heads of state to the royal letter of February 23 reflects a shared conviction that the accession of Morocco will be beneficial for all.